Two design studios, both from Italy, have been announced as the joint winners of the Lamborghini Road Monument Competition, the international architectural contest launched last September for the design of two installations inspired by the House of the Raging Bull. Both ACQ Studio and 0.9 won the unanimous vote of members of the Jury and will see their projects installed at the gates of Sant’Agata Bolognese, the town where Automobili Lamborghini is based, within autumn 2017. Automobili Lamborghini decided to make an exception and announce two winners on account of the very high quality of the entries. Both winners will receive the total prize money of 12,000 Euros. The entry submitted by ACQ Studio team from Livorno is an installation featuring taut, minimalist and sharp lines: the same stylistic language of Lamborghini super sports cars with their geometrical surfaces and intersections. 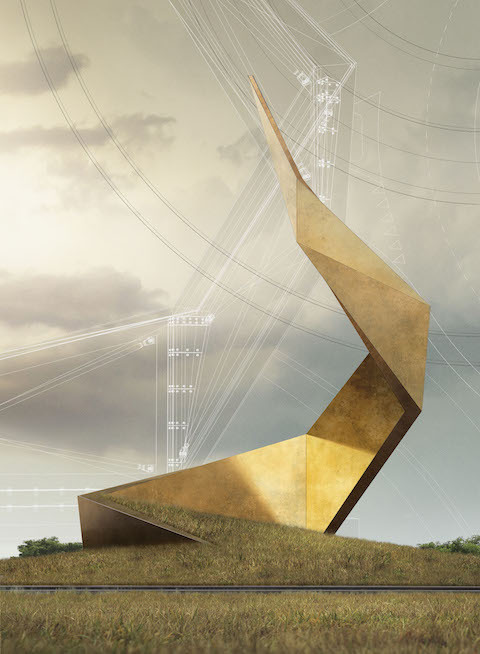 The project penetrates the ground before soaring up towards the sky with the golden, stylized and linear forms of the Lamborghini shield. The entry submitted by “0.9” team, originally from Milan but now based in London, pays homage to speed and dynamism. The installation takes the idea of ‘suspended speed’, and reproduces the silhouette of a Lamborghini super sports car in sections. How the work is seen depends on the angle of observation, in the same way that a Lamborghini changes as it flashes past at high speed. The metal sections emphasize the dynamic and changing effect of the sculpture. The event was launched by Automobili Lamborghini in partnership with YAC, Young Architects Competitions, and proved to be a record contest: over 500 projects were submitted to the jury by design studios and architects from around the world. 25% of applications were sent in from Italy, the remainder from other countries in Europe, America (20%), Asia (20%), Oceania (4%) and Africa (2%). Young architects, designers and practices competed to create works that will enhance the entry points to the town of Sant’Agata Bolognese, where Lamborghini is headquartered. The competition’s goal was to offer the local area a renewed sense of identity with installations making their marque on contemporary architecture through their interpretation of Lamborghini’s philosophy: visionary, cutting edge in terms of its technology, and stylistically pure. The contest was sponsored by the Emilia-Romagna Region, the Metropolitan City of Bologna, the municipality of Sant’Agata Bolognese, the Academy of Fine Arts of Bologna and Unindustria Bologna, and had the benefit of an exceptional international jury. Four internationally famous architectural practices, such as Zaha Hadid Architects, Studio Fabio Novembre, Studio Libeskind and Foster + Partners, judged the entries alongside Francesco Dal Co, Editor of «Casabella», Giuseppe Cappochin, President of the Italian Professional Association of Architects, Annalisa Trentin from the University of Bologna, Stefano Domenicali, Chairman & Chief Executive Officer of Automobili Lamborghini, and Mitja Borkert, Director of Lamborghini Centro Stile.